Tokyo, Japan, March 7, 2013 – NSK Ltd. (NSK; Headquarters: Tokyo, Japan; President and CEO: Norio Otsuka) announced today that it has established new branches in Saint Petersburg, Russia, and Dubai, United Arab Emirates (UAE), in the Middle East, both of which are important emerging markets. Business activities have begun to commence operations at both sites. Demand for bearings is projected to grow considerably in emerging countries as industries develop and infrastructure expands. Accordingly, NSK is adding these new branches and increasing its sales distributors in an effort to expand its sales areas and market share. In the past, NSK UK Ltd. a sales subsidiaries of NSK Europe Ltd. in UK, had been responsible for the market in the Middle East. The NSK Bearings Middle East Trading Co., Ltd. (Istanbul, Turkey) was responsible for developing this business. In the Russian market, demand for bearings and other machinery components has continued to grow on the back of steady economic growth driven by industrial development, including the automotive industry and industries related to energy and natural resources such as oil and natural gas. While NSK Polska Sp.z o.o., a sales subsidiaries of NSK Europe Ltd. had mainly covered the Russian market in the past, NSK has now established its first branch in Saint Petersburg, Russia, to facilitate its customer. * Saint Petersburg: As Russia’s second major city after Moscow, this city is an industrial center with a strategically located port, a receptive business environment and a stable local government. It is also an international city with many thriving industries, including shipbuilding, machinery manufacturing and metalworking. NSK has also been focusing on the market in the Middle East and Russia, which are demonstrating remarkable economic growth. 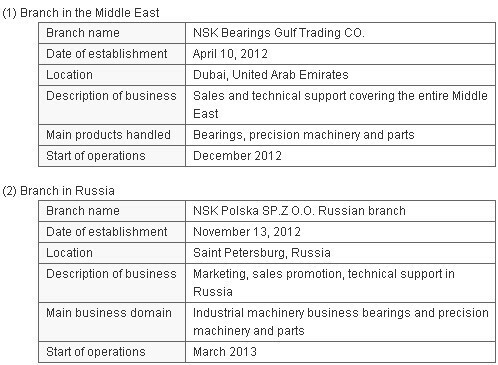 To continue making progress in emerging markets, NSK has now established branches in Dubai, UAE, and Saint Petersburg, Russia. These new branches will work to fully localize our business activities in each region in cooperation with local sales agents dealing in industrial machinery bearings.